One of Mitakihara University's signature events returns this week to campus: it's the annual Homecoming Week, celebrating the storied history of the Magi football team and a celebration of the unique traditions that define Canada's premier urban research university. 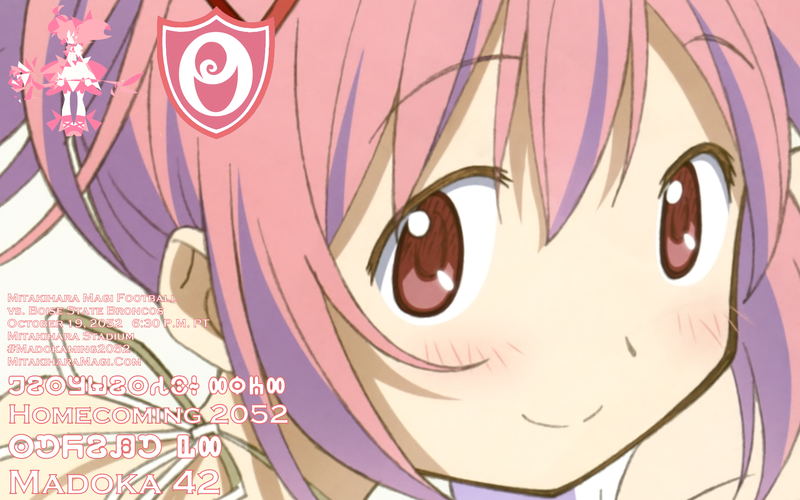 This year's Homecoming Theme is Madoka 42. Junior liberal arts major Fuuko Kurasaki is, for the third straight year, the Homecoming Committe Chair and was excited when asked about this year's Homecoming Week. "This year, we salute a piece of literature that is a required reading text in a number of classes, called 'The Hitchhiker's Guide To The Galaxy,'" said Kurasaki. "42 is the Answer to the Ultimate Question of Life, the Universe and Everything. "We also salute the most unexpected of combinations in our offensive arsenal. D.W. Hinoi, who is now our starting quarterback, is No. 4 on your roster, and wide receiver Takumu Mayuzumi is No. 2. Combine 4 and 2, and you get 42. So while this isn't meant to be a slight on Chauncey Wilson, who wears No. 42, our 42 combination is effective at delivering bad luck to opponents when the opportunity arises. "With this being the 42nd anniversary of this university, we hope that all of Mitakihara Town comes down to experience Mitakihara Homecoming 2052." A number of events will take place leading up to the Homecoming Game against the Boise State Broncos on October 19, 2052 at 6:00 p.m. PT/9:00 p.m. ET. The game will be televised by City, TVA Sports, The Mtn., NHK and BBC. Special Exhibit at Saito Library: Dissecting The Hitchhiker's Guide To The Galaxy. For more information, please visit the Saito Library website. Mitakihara Director of Bands, Dr. Mary Cochran holds a special band practice with members of the Marching Ultimates, the university's marching band. Tickets required: $45 for adults, S30 for students and seniors. Tickets can be purchased directly through the Mitakihara Box Office by phone at (250) 4MADOKA or online at the box office website. Battle for the Arrow Of Light, Sakura Bowl Stadium. Tickets required: $60 for adults, $40 for students and seniors. Tickets can be purchased directly through the Mitakihara Box Office by phone at (250) 4MADOKA or online at the box office website. Following the Women's Volleyball game vs. the British Columbia Thunderbirds, the 2052 Mitakihara Magi Football Team will be introduced. Speeches by head coach Tatsuya Kaname, offensive team captain John Nelson, defensive team captain Brian Brown, athletic director Mami Tomoe and university president Homura Akemi will be made. 5:00 - 8:00 a.m. - Breakfast at the Dorms - Passport holders are invited to enjoy a hot breakfast at the dorm of their choice. Pay at the door (cash please), cost is $15 per person. Pack a picnic and set up a tailgate with your friends prior to the Mitakihara-Boise State football game. The Madoka Tailgate Area will be located inside Gate 13. Cars can park here for $30, payable on-side. Tailgate is permitted for 2 hours prior to kickoff and for one hour following the game. More information can be found at the Athletics website. Cheer on the Mitakihara Magi as they take on the Boise State Broncos. A block of tickets for Madoka Homecoming is currently reserved through the Mitakihara Athletic Ticket Office. Tickets are required and cost $18 each, children ages 12 and under are free. Tickets can be purchased directly through the Mitakihara Box Office by phone at (250) 4MADOKA or online at the box office website. Barbecue in the Mitakihara Stadium Parking Lot, Gates 7-9. A voucher for the "Ika's BBQ Fan Zone" is included in your Homecoming registration price. Please be sure to check-in at the Homecoming registration desk to receive your meal ticket. Drinks will be sold separately on-site. A variety of family a children's activities will be offered in the "Fan Zone," including face painting, music, sports games, prizes and raffles. Get ready to put on your running or walking shoes and take a cruise around the different places on campus and in Mitakihara. The route starts at Magia Quad and will weave around the city before ending at Madoka Square. Registration is $60.00 ($30.00 for students with ID) at the Magia Quad tent from 6 a.m. to 8:30 a.m. All proceeds benefit the BC Cancer Foundation. Refreshments and medals will be provided at finish line.